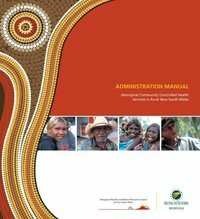 In collaboration with the Aboriginal Health and Medical Research Council of NSW (AH&MRC), the NSW Rural Doctors Network (RDN) has developed, updated (in 2010) and distributed an Administration Manual for Aboriginal Community Controlled Health Services (ACCHS) in rural New South Wales (NSW). The manual is designed to enable these ACCHS to develop or revise policies and procedures for their medical services, and to assist those who wish to move towards and through the accreditation process. It includes accreditation specific copyright material generously provided by QIP/AGPAL as well as materials specific to Aboriginal Medical Services. The original 2007 version was piloted by five ACCHS (both urban and rural) and their feedback was incorporated into the final manual. The 2010 version includes Quality Assurance Material and was tested in a north coast ACCHS. Funded by the Australian Government Department of Health's Rural and Remote General Practice Program - and the update by the Office of Aboriginal and Torres Strait Islander Health - the manual can be downloaded and customised to the needs of ACCHS. The manual comprises two documents. The first is instructions on how to use the manual and easily customise it to suit. The second is the manual which has been designed with links to web pages to ensure that as much information as possible remains current. The manual will be updated on a regular basis and subsequent versions will be placed on both this site and the AH&MRC website. To help ACCHS to develop their own job descriptions, one NSW Rural ACCHS has provided a list of job descriptions for general use. RDN thanks Durri Aboriginal Corporation Medical Service, Kempsey, for providing these job descriptions. These have been de-identified to make it easy for other ACCHS to use. To go directly to a particular job description, locate it in the index and press the Control button (Ctrl) when you click on it. For assistance with this manual please contact the RDN Manager of Rural Medical Services Initiatives on Tel: 02 4924 8000 or Email or contact the AH&MRC Project Officer (Accreditation) on Tel: 02 9212 4777 or Email.